Universal Orlando Resort will host a fun filled weekend featuring the Nickelodeon hit live action series “Every Witch Way” on December 12 and 13. “Every Witch Way” is a spell-binding tale that follows teenager Emma Alfonso (Paola Andino) as she moves to Miami and discovers that she isn’t so ordinary—she’s a witch. The series, which recently concluded its second season, is a bona fide hit consistently winning its time period (Mon-Fri, 7:30-8 p.m. ET/PT) with kids 2-11. Season 3 of “Every Witch Way” will premiere in 2015, sparking mystery and adventure with a daily dose of magic that will keep viewers captivated and enchanted. During the event, guests can also experience one-of-a-kind traditions that the entire family will enjoy at Universal Orlando’s Holidays celebration. Running daily from Dec. 6 to Jan. 3, guests will come face-to-face with The Grinch at Grinchmas, watch majestic Macy's balloons wind through the streets and hear Christmas music sensation - Mannheim Steamroller - perform beloved holiday classics. It’s a weekend of bewitching and holiday fun at Universal Orlando Resort—all included with admission to Universal Orlando theme parks. 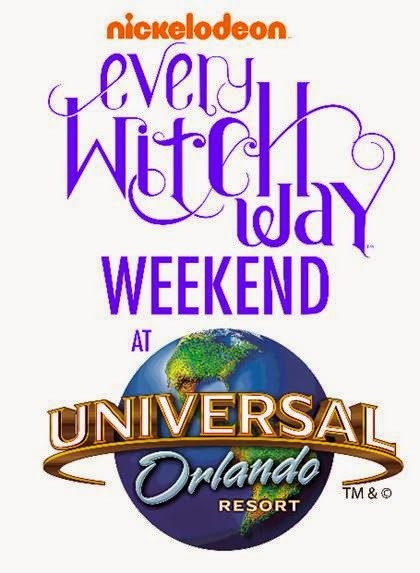 For more information, visit http://www.UniversalOrlando.com/events/everywitchway.aspx.